When is the season for the northern lights? The aurora happens up towards Earth’s magnetic poles all year round. However, it needs to be dark for us to be able to see the lights, and during the summer months in the northern hemisphere it’s simply too light in these latitudes to see the aurora. Therefore, one could say that the season for the northern lights lasts from September to April. But further factors determine when you should plan your northern lights trip. Aside from the season, what matters most is the weather and of course you can’t predict that as far in advance as you need in order to plan your trip. 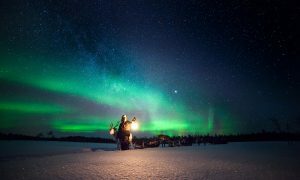 I spoke to northern lights tour experts Lizzie from Discover the World and Laura from The Aurora Zone to find out what they recommend. Autumnal, winter or spring aurora borealis – what do you prefer? 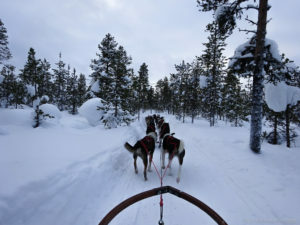 Dog sledding out through the forest from the Icehotel, Sweden. 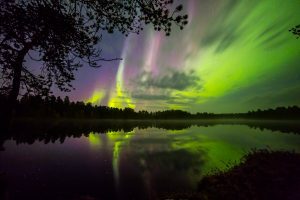 So, you see, the aurora season may be from September to April but your aurora experience can be vastly different depending on when you choose to go. We’d say that’s a good reason to go more than once! Thank you, Lizzie and Laura, for sharing your recommendations.